Imperial Settlers is a fantastic game – genuinely skillful, deeply absorbing, and absolutely beautiful. Our four and a half star review is a testament to how much we like it. We’re not just about how good games are here at Meeple Like Us though – we’re also pretty hung up on how accessible they turn out to be. Do we have to raze Imperial Settlers to the ground? Let’s find out! 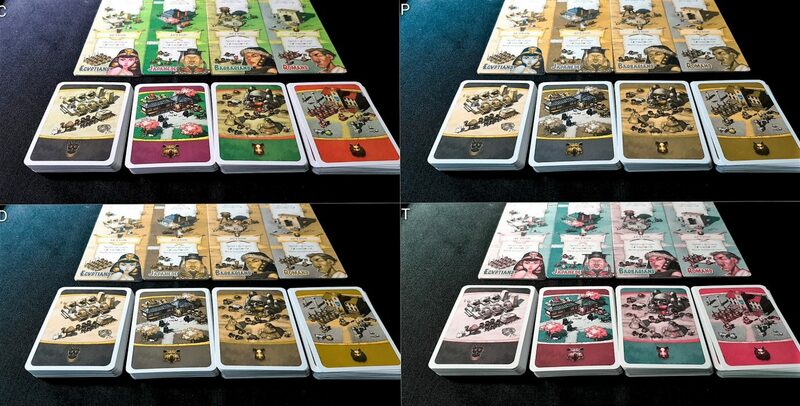 All the faction boards adopt a noticeably different art style – colours lack differentiation, but you can’t mess up which is which. 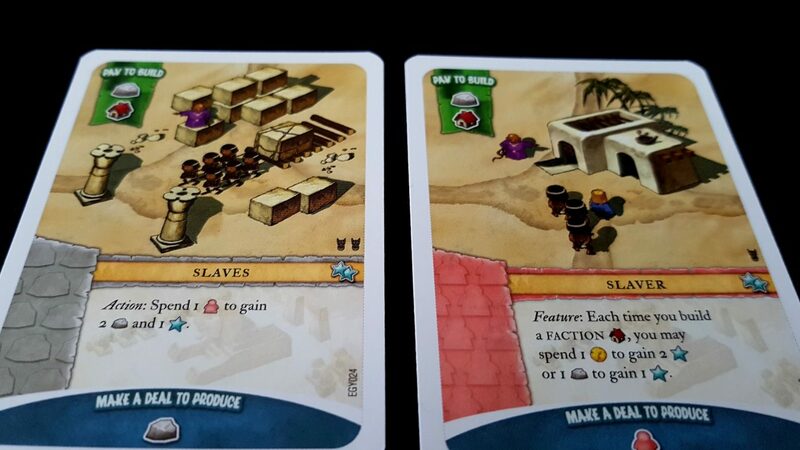 There are some cards that make use of colour coding for their actions – for example, ‘earn a victory point for every red building in your empire’. These colours overlap significantly, but they also have their own pattern to the texture. The text here explicitly references the pink buildings, which isn’t great, but the building itself is pink – this is, as far as I am aware, a rock solid rule that no building will give you bonuses for a colour without being that colour itself. It means you can check like against like even if you can’t tell the colours apart by name. Even the score markers have different icons on them, and have a (slightly) different shape that differentiates them. I’m on the higher score mark, right? However, this is not likely to be a serious issue, and there are any number of ways this edge case can be easily resolved without meaningfully changing the game. We offer a strong recommendation for Imperial Settlers in this category. All of the icons on the cards are well contrasted, and mostly with readable text. Unfortunately, this text is quite small, and the occasional application of italics makes some of it difficult to read. Much of it is in what seems to be an 8pt font, which is a shame given how much empty space there is on numerous cards. This falls considerably outside what would be ideal for visual accessibility, which is around 14pt. That is of course a tall order for board games, but the closer we get to that the better. It’s especially troublesome here because your cards are kept in a hidden hand – on the plus side, that means you can examine them at leisure. On the downside, you can’t rely on other players to help you out through reading the text aloud for you. Iconography is clear and used consistently, which is great – however the icons are very small, which is not. Resources though are indicated with colour as well as icon, so unless there is a conjunction of visual impairment and colour-blindness this particular aspect shouldn’t be too much of a problem. Resources are pleasingly tactile, and all feel meaningfully different – you can reliably identify which is which by touch. They may run out though in four player games, because there aren’t an awful lot of them. 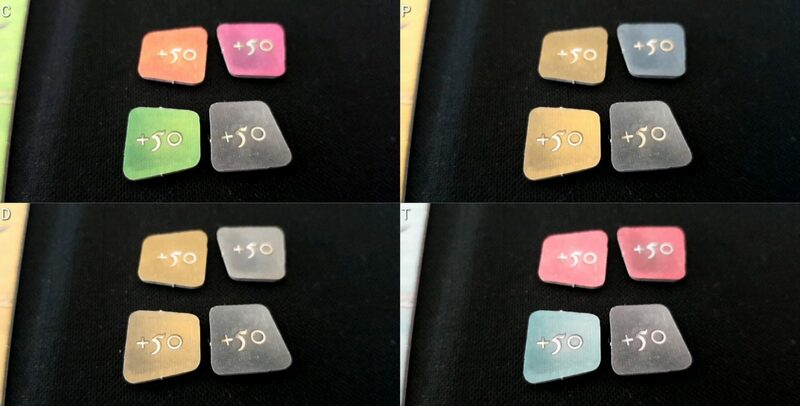 The game provides 5x markers for those occasions, which would require a certain degree of care when working out how many resources are available. The only other significant area of concern is when considering which enemy structures to raze. It’s hugely important, as per the review, to understand how an opponent’s economic engine is constructed and how it’s likely to evolve. Picking the right card to raze at the right time is critical to effective spanner-throwing. It’s going to be difficult, without close inspection, to tell what the viable candidates for attack are. The act of investigation reveals game information. Spend too long examining a card without acting on it, and you may find that a defence token makes its way there before you get time to bring out the swords. 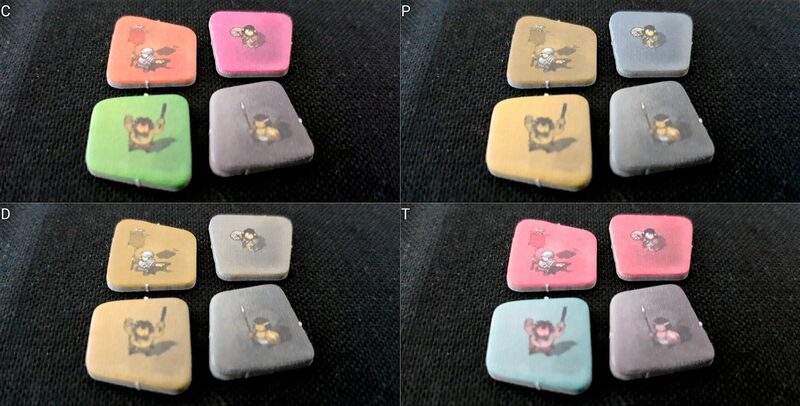 You can only place defense tokens on your turn, but for the sake of game flow and limiting downtime it may be necessary to spend time examining an enemy civilization outside of normal turn order. Some of these issues though are alleviated by the elegant layout of the player boards. Unless you are considering attacking the Japanese, all the cards that are left of the board will be ineligible for razing. That means you only need to consider the cards on the right. Even this is made easier by the visual design, because production is on the top, then features, then actions. If you have a rough idea of what an opponent has available in their empire, it’s easy to focus only on those key elements. There usually won’t be too many of these, since common cards are traded in for faction buildings at a brisk pace. As usual though, this is all dependent on the ability to read, with an assistive aid, the text on the cards – it’s a text heavy game, with many subtleties that need to be tracked. For those for whom this won’t be possible, the game is almost completely inaccessible. There are special codes on each card, but they don’t seem to link up to any online card catalogue or the like. At least, I couldn’t find one. 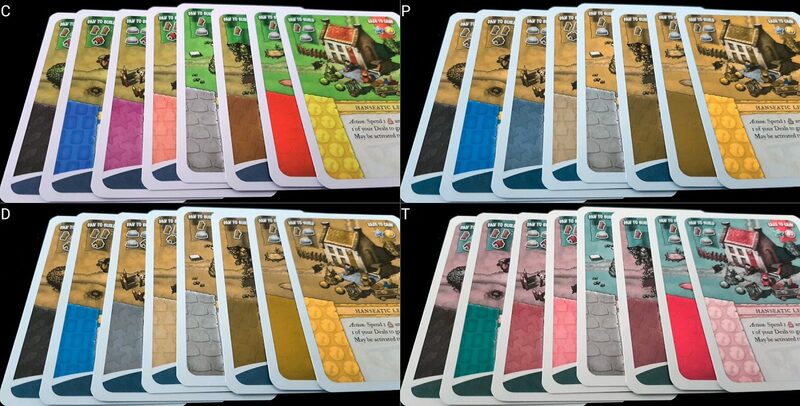 For everyone else, we’re prepared to offer Imperial Settlers a tentative recommendation – the font size is likely to be an issue, but not one that can’t be worked around if the will is there. There isn’t much good news in here, as is probably obvious from the review. This is a tough game that requires a huge amount of analytical sophistication. You need to understand your engine, and the engine of everyone else. The game requires a not inconsiderable degree of numeracy, as well as the ability to evaluate the shifting economic value of goods, and the long-term implications of construction. Much of play is about marshaling scarce resources and playing cards that will get you more of them. The order in which actions are undertaken may be critical, and as such the ability to evaluate chains of outcome is key. 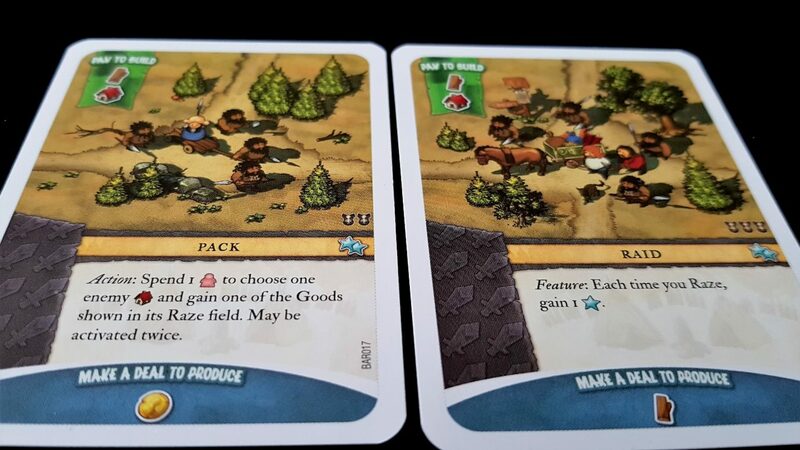 Imperial Settlers requires a considerable degree of literacy, and while no individual instruction is complicated, the decision space that must be considered increases considerably every round of play. Understanding a deck also means having a fair idea of what’s there to be drawn from both the common cards and your own faction deck. That puts a considerable burden on memory. You don’t need to do this, but it really helps. Otherwise, memory isn’t a major requisite to play since everything will be arrayed in front of you. However, given the number of options and features you’ll put together after a while, you may find even ease of reference doesn’t solve the problem. An important element of effective play is the ability to leverage card synergies, and doubling up on buildings can be a powerful technique if you can utilise it properly. Doing this will change the relative value of your actions too, so you need to be constantly assessing the return on your investment in terms of time and resources. For example, if you buff up raze so that it costs less, it dramatically decreases the value of razing cards in your own hand. If you build a canteen, it changes the relative value of pink cards. There may be a half dozen or more of these effects throughout your empire, and you’ll need to know each and every one of them. Some of them too may disappear as common locations are converted into faction buildings and as you become the victim of enemy aggression. The context of your actions is constantly shifting, turn by turn and round by round. The game flow in terms of phases is consistent, but the action phase consists of a turn by turn circuit of the table, which will have variable length and inconsistent order as people pass. Evaluating the impact of what people have done on their turns too is important, and even with narration this will be difficult to follow. All of this of course is if you want to play well, but while there is probably some value in simply buying cards from a supply making use of resources you have, it’s not going to be meaningfully the same game as the one we discussed in the review. As such, we don’t recommend Imperial Settlers in the fluid intelligence category. We’re prepared to give it a tentative recommendation in the memory category though. As usual, this is highly contingent on the nature of emotional accessibility issues, but Imperial Settlers is a game where you pretty much have to get all up in your opponent’s face if you plan on doing well. Many building bonuses are based on the expectation of a degree of PvP, and one faction (the Japanese) practically has it as a pre-requisite. That means that you will be, regularly, seeing other players burn down your houses for their own gain. You’ll see them taking your resources and occasionally even taking your cards out of your deck. Aggression is built into the rules, and it’s not easy to play without it. This is compounded by the fact the game has nothing that would stop, or even disincentivise, directed bullying or ganging up. If you’re the last player in a four player round, you can theoretically find yourself three buildings down by the time you even get to place your defence token. At that point, your engine might not just be damaged, it might be invalidated entirely. If you’re playing as the Japanese, the risk is magnified because any building can be razed. The Japanese are a sort of ‘advanced faction’ that require very special understanding, so they wouldn’t likely be the first choice for a novice. All factions though are subject to painful and non-consensual PvP interactions. Coupled to this is the nature of the engine building in Imperial Settlers. It does not tolerate mistakes, and if the gears of your engine crunch too readily in an early phase you’ll find yourself seriously lagging other players. 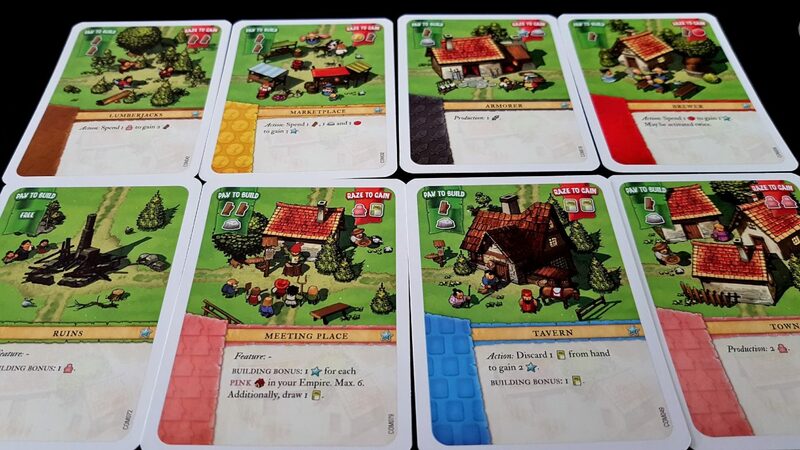 You can’t afford to have a bad round in Imperial Settlers – every round has to be at least okay. That simultaneously puts a lot of pressure on play, and enables massive score disparities. A competent player might manage fifty or sixty points. A good player will be hitting eighty or ninety. The best players will be hitting one hundred and twentyish. A bad player? Probably around twenty or thirty. In a game that is so transparently about careful play and well marshaled resources, there’s only so far you can justify poor performance with the luck of the draw. The fault is almost always in the way you’ve played, not in the hand fate dealt you. The game is also subject to obviously punctuated play in which you haven’t aligned all the disparate elements of your engine – when you have too few cards to spend your resources on, or are drawing too many cards and can’t afford any. That’s a failing of your engine, and in turn a failing of your own choices. Similarly, if you don’t have ways to transmute resources into victory points, you can’t do much but watch as everyone else leverages what seem to be their unlimited resources to zip merrily around the track as if propelled by rockets. Mistakes, when they are made, are incredibly hard to fix. If you spend resources poorly, you may find yourself knocked out of a round with breath-taking rapidity. Not everyone gets an equal chance to play either – good players juggle their resources like a pro-footballer playing ‘keepy-up’. They’ll eventually fumble and run out, but until they do it looks like it’s going to go on forever. If all you managed to do was build a quarry and then watch someone burn it down, it might be hard to convince yourself you’re having fun, really. We don’t recommend Imperial Settlers at all in this category. 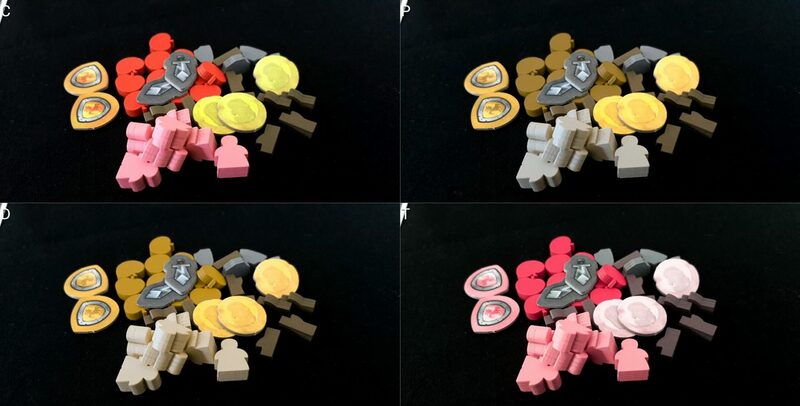 There isn’t a lot of physical interaction with the game – you collect resources, place cards in your tableau, distribute defense tokens as and when it’s required, and that’s about it. Even the draft that occurs at the beginning of each round doesn’t require physical interaction – you just pick cards from a set offering, in order. There are quite a lot of resources you’ll need to manage, and the individual tokens are quite small, but really there’s nothing to say it has to be with the tokens themselves. You can substitute anything really, including computer tracking or a notepad. That makes it very versatile. 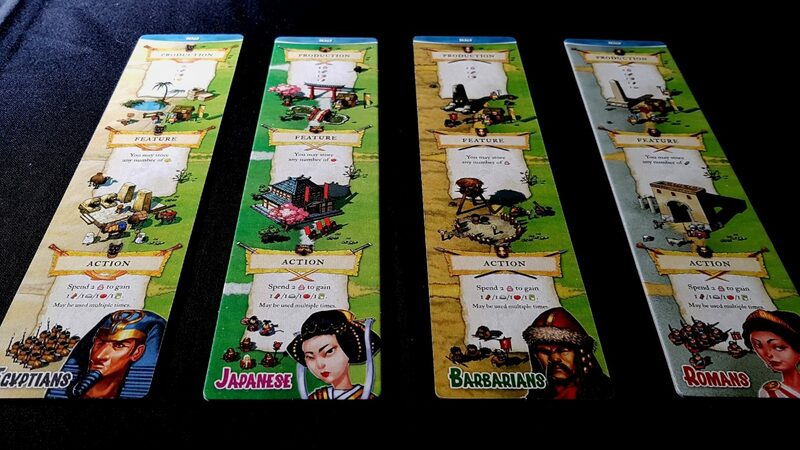 Those playing with the Japanese may have a little more to worry about, since worker resources do double duty as defensive samurai, and this in turn makes the tableau somewhat likely to be dramatically altered in the event of it being nudged or shaken. The only slight area of concern is that the game makes use of secret hands, and while these may not be especially large they do require relatively regular manipulation. A card holder will serve well here, although depending on the model it might obscure key information along the bottom. The one I have has is made of transparent plastic though, and it’s not a problem with that. If yours is more opaque, this might be a consideration. The game lends itself very well to verbalisation – while there are duplicates of many cards, you never need to precisely differentiate them in a way that doesn’t lend itself to explanations. ‘The armoury in my hand’ versus ‘the armoury in my tableau’ for example. Each resource has its own name, and each card too has a title of its own. All actions you need to undertake can be unambiguously referenced. 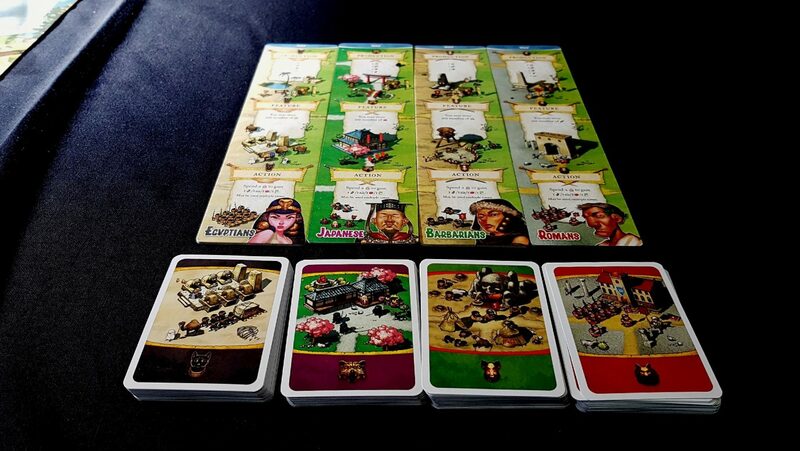 As such, we’ll offer a strong recommendation for Imperial Settlers in this category. There is a reading level associated with the game, but otherwise no formal requirement for communication other than indicating which of your opponent’s buildings you’re burning to the ground. We recommend Imperial Settlers in this category. You get a choice of your figurehead. The box art has a definite slant to more men than women, but otherwise there’s little to complain about that doesn’t come across as pernickety even to me – for example, the fact that in the cards women are mostly in subservient roles and the men are in positions of power and knowledge. For example, the factions. 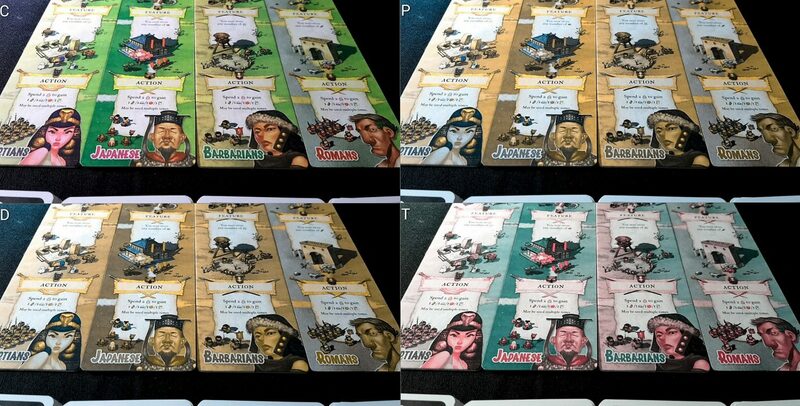 We have Romans (fine), Egyptians (okay), Japanese (sure) and… Barbarians (huh?). The art work seems very much to conflate the Huns and Mongols into one somewhat pejorative ‘Barbarian’ faction. It’s just strange. I mean, the game adopts a cheerful irreverence in its art design throughout, and with the expansion pack introducing Atlanteans it’s clear they’re not taking the factions very seriously. Curious though. Similarly, I read an interesting Reddit article on the Japanese art style which seems to suggest a kind of carelessness in the research. As usual, I am wary about too readily invoking claims of cultural appropriation, since it’s not my place to decide what is and is not appropriate for other cultures. Something to perhaps bear in mind though. Other odd things include the fact the art is so cheerfully upbeat and sanitized most of the time, and yet occasionally throws in the odd fridge horror moment. What are those pack barbarians planning to do to that woman they’ve stolen? And those raiders are presumably taking slaves, right? To whom are they going to sell them? Well, if you want a pyramid in a hurry what are your other choices? This doesn’t bother me, but bear in mind that the scars of the slave trade are still being borne. The National Museum of African American History and Culture was officially opened in 2016 by a woman who’s father had been a slave. A degree of disquiet at the casual referencing of slavery for recreational purposes is not unreasonable. Sure, this is ‘historical slavery’, but I’m not sure there’s a lot of moral high-ground in defending its inclusion on those grounds. It is though a vanishingly small part of the game, and your mileage is very much going to vary as to how troublesome its inclusion will be. At an RRP of £40, it’s pricey – it only supports four players, although it works well for all player counts, including solo play. However, it’s a game good enough to justify repeated, and intensive play. It’s probably at its best with a two player count, but plenty of fun for all. Topping out at four players though does mean you pay a lot for a game that won’t scale up to larger game nights. Overall, we’re happy to recommend Imperial Settlers in this category. The existence of hidden hands is an issue for physical, cognitive and visual intersection – we don’t recommend the game for those with cognitive impairments, but it’s going to be an issue for those with physical and visual impairment. The tiny font size exacerbates this, because manipulating the cards in hand is in many cases dependant on small state information that you can’t expect any other player to help you with. Where there is an intersection of visual and physical impairments, the need to get up close and examine an opponent’s tableau may become a problem. You can remove cards from their context, but there may be a lot of them you need to consider and doing this card by card, for each player, may be highly deleterious to game flow. There is quite a lot of downtime between turns in larger games, and this becomes worse when one player finishes early and needs to watch everyone else continue on until the next phase. This can trigger situations of emotional distress, or bring on problems with attention or concentration. 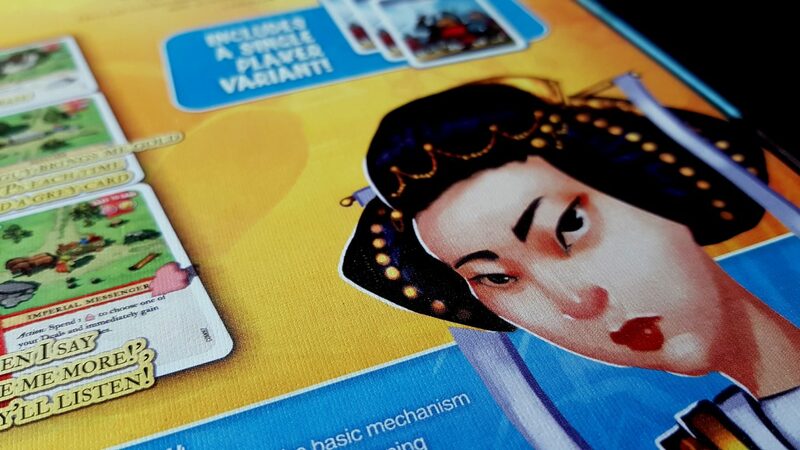 Imperial Settlers is cut-throat in its competition, and as we often discuss in this section that tends to create opportunities for problems when dealing with mixed ability groups. Competition disincentivises sporting behaviour – it makes it less likely people will point out mistakes, or be forgiving of errors, where the cause was related to accessibility requirements. This is, as always, highly dependent on your group but worth bearing in mind. Imperial Settlers is an excellent game – it’s absolutely top notch if you can stomach the vicious competition it mandates from all players. We gave it four and a half stars because it is difficult to find meaningful fault with it. While that doesn’t hold true for its accessibility profile, many of its grades stem from the fact it just expects players to be good and to be tough. That puts a lot of pressure on cognitive faculties and emotional resilience – while you certainly can play it without being particularly analytical, it’s becomes a game of frustrating juddering, like missing the bite on an old car. Beyond that, we can offer at least a tentative recommendation across the board, and have some particularly positive things to say about it from a physical perspective, and the attention given to issues of colour blindness. If you can play it, and it tickles your fancy, why not consider it? You are very unlikely to be disappointed.